Guys. It's been a WEEK. I mean, it's literally been a week since I posted the last meal plan, but it's also been such a jam-packed week of work + family over here. It feels like a triumph that I'm even able to get to this post today - we'll see if I get it posted on time... [EDIT: I'm finishing this 5 hrs later thanks to a v. v. v. short nap by the toddler]. How many of you tried following last week's meal plan? I touched base with one person that did (ahem...it was my mom), and one piece of feedback she gave me was that the sweet potato curry was delicious but damn was there ever a lot of chopping involved. Same goes the winter stew. And I can't deny the truth of that! Both those dishes are jam packed with hearty root vegetables, tubers, and greens, and turning them into bite size pieces means a lot of knife work. Like I mentioned in the first post, these meals plans are coming right from the scribbled notes I stick on our fridge every week - in other words, it's what works for us. When I have Clay around to help entertain Junie, I love the prep. I feel like cooking is one of the few moments of pause that I can count on getting each day. I find the repetitive peeling, dicing, and slicing meditative and nourishing at this time in my life where I don't seem to have the opportunity very often to get that elsewhere. It also saves me from just hunkering down and scrolling Instagram the minute I get a break from parenting - not the kind of downtime my brain needs. But then also sometimes it feels like too much! And we fall off the plan-wagon and order a pizza. If you're going to follow one of these naturopathic meal plans, make it work for you - maybe that means prepping ingredients for the week on Sunday afternoon and storing them in the fridge; or starting with just following two or three meals on the list and having easy pantry meals on the other days. I made bone broth from chicken on the weekend, froze it in yogurt containers and used it throughout the week on all the recipes that called for stock or broth. A lot of the sides that I list are things that we have often and I don't usually follow a recipe for. I've linked to recipes that explain how to cook them, but often they include a few "extras" (e.g. sauces) that we don't tend to make. 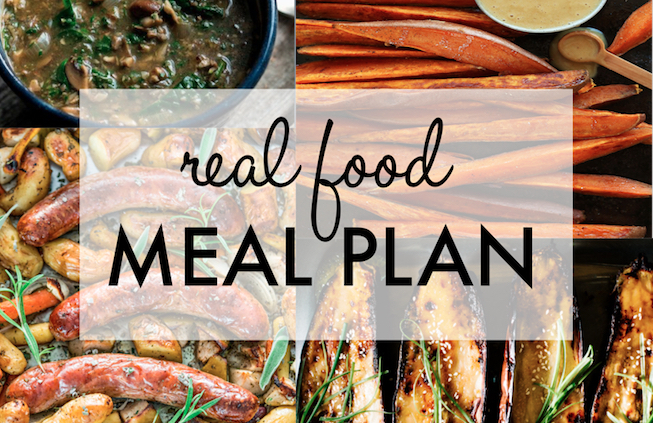 On this week's meal plan we've got miso-roasted eggplant, two soups - mushroom & a "pot likker" - baked chicken meatballs, and a sausage & apple sheet pan meal. Let me know what you think! MAIN: Baked Chicken Meatballs from Smitten Kitchen (I <3 Deb). Advanced prep: Whatever you see fit! Tips: I didn't prepare that honey mustard dressing with the sweet potatoes, but just wanted to point you in the direction of a how-to if it's a new dish for you - I bet it's good though! If you like a juicier wedge, cooking at a higher temperature seems to not dry out the potato as fast. Tips: Instead of ham we used kielbasa from VG meats - totally delicious. I also added a splash of sherry vinegar at the end of cooking and it was great! A new recipe for me and we will definitely be making it again. Tips: We didn't braise our kale with onions like that recipe suggests, but it sounds great! Advanced prep: Buy sliced mushrooms if you are tight for time; I also used some dried shitake that we happened to have on hand. Tips: I used kale instead of spinach and I added it right at the beginning of cooking instead of when they suggest adding the spinach. Tips: Our co-op carries awesome local sausages, I used a mild Italian here; I cut regular carrots into chunks instead of baby carrots and found that Yukon Gold's tasted great instead of fingerling.